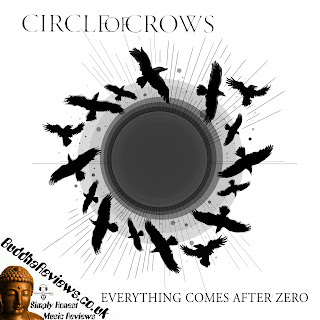 Circle of Crows are a Hard Rock band from Newquay, UK. Consisting of Kyle Gormley on Guitar and Vocals, Josh Smith on Bass & Steve Sudlow on Drums. They only formed in 2017 but have been very busy playing shows around South-West England and with this Debut EP, they have ambitions to spread their wings even further. This six-track EP begins with their song "How To Wait For Nothing" which is a great mix of funky, groovy sections with some slow and melodic sections blended with iconic hard rock vocals reminiscent of James Hetfield in some regards. The second song is called "Broken Children", featuring guitar & bass riffs that you cannot resist nodding along to, well-written lyrics and good use of tempo changes. I also love the guitar effects and epic solos! Track three "Into The Sun" is a soft and gentle rock song with melodic vocals which displays Kyle's vocal range very well. This song also features some intricate instrumental sections adding to the whole feel of a nice song to chill out to.... until near the end when the tempo and volume both lift to raise your energy and make the hair on the back of your neck stand on end. The fourth song is the title track, "Everything Comes After Zero" which is a very energetic, bouncy song and reminds me of early songs by 'The White Stripes', but in a good way. This is yet another song that will get you moving and singing along to even during your first listen! Song number five is "Nightmare Cinema" featuring very groovy guitar riffs blended with heavy bass and drums to make an interesting and excitable tune with some proper rock vocals. Listen out for the epic guitar solos near the end! The sixth and final song on this EP is called "Open Doors" which is another melodic rock song with Southern-American style rock vocals. I found myself closing my eyes, listening to the story and allowing the emotion within to flow right over me. In conclusion, what Circle of Crows has put together here is a really great selection of their own songs which showcases their wide range of talent. This EP has it all, from groovy riffs & funky drumming to energetic choruses and sometimes melodic, sometimes shouty vocals. What more could you want from a Hard Rock EP?